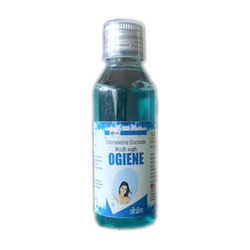 Our Chlorhexidine Gluconate Solutions products take total care of oral hygiene that includes keeping mouth and teeth clean, gum diseases and prevent cavities. Our oral care products are acknowledged due to their simplicity in the treatment involved and immediate results. Chlorhexidine Gluconate Solutions are often used as an active ingredient in mouthwash designed to reduce dental plaque and oral bacteria. All our products are extensively used in domestic purposes and hospitals for maintaining a clean and hygienic environment. Looking for Pharmaceutical Oral Mouthwash ?